Loving care in a dedicated 'home from home' environment with dedicated sleep and play rooms. 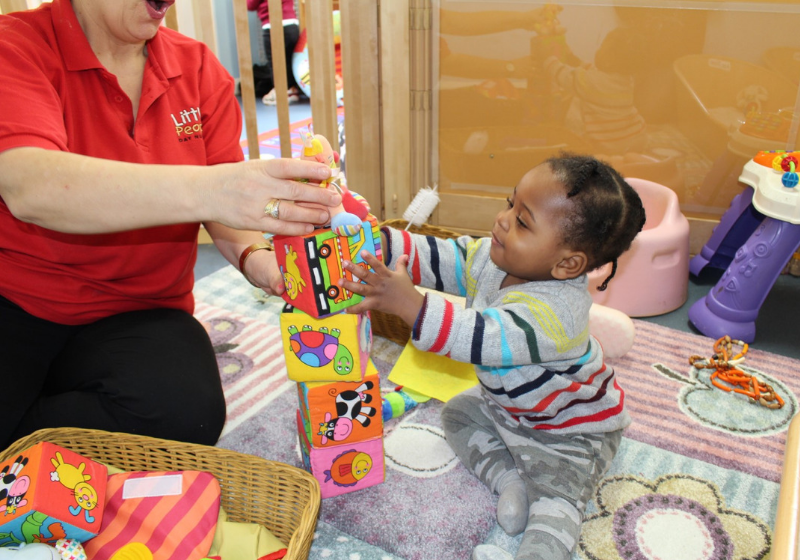 To help your child adjust to life in the nursery we operate the Key Worker system which provides a trained and dedicated member of staff to care for your child throughout the day, which gives him/her all the time, love, care and attention they need. The baby rooms include their own bedroom, art/messy room, bathroom and living room which is designed to create a welcoming home from home environment to ensure that you and your baby immediately feel comfortable. Long-serving, qualified and experienced staff make this very high level of quality care possible. High staff to child ratio – we always exceed the guidelines of 1:3 ratio. Home cooked food made fresh each day, using high quality produce and organic fruit and vegetables. See here for more information on our healthy eating. Special dietary requirements catered for your child’s individual needs and weaning advice. Individual sleep patterns are catered for in our separate baby bedroom and sleeping children are always supervised by a member of staff. A variety of stimulating activities are on offer each day, malleable/messy play, sensory activities, baby yoga, music and daily outdoor play or excursions in our special baby buggy. We have an open door policy so you can always drop in to see your child. When joining the nursery, you will be provided with your child’s own development folder where your baby’s requirements will be noted and discussed with your Key Worker. Your baby’s developmental progress will be recorded in this folder. This is completed throughout the year and is discussed at each parents evening. At birth the brain has all the 12 billion nerve cells it will ever have however during early development, connections or pathways form between the cells called synapses are built and these connections that form make up the mental process known as learning.Millions of these connections form during the early years, some of which will be pruned off through not being used while others will develop in more complex ways by being used frequently. The Little People of Willow Vale nursery is so friendly and welcoming. My son is now 3 years old and has been attending for the last 18 months. He has benefitted so much from his sessions at the nursery in terms of his language development, social skills and learning good routines. All the ladies who look after the children are so caring and nurturing, they really get to know the children well and make them feel loved and supported. My son is 16 months and has been in the nursery for 10 months now. Amazing and caring staff. They get to really know all the babies and adapt to their specific requirements and personalities. The babies do many different activities and go outside to the garden or park every day. They get to learn a lot. Parents are informed daily through an app on what the babies have eaten, the sleeping times and activities the babies have done through the day which is really nice. Deeply human and genuinely caring nursery staff. I feel rest assured every day that my girl is taken good care of. While Little People of Fulham may seem a bit small, the teachers more than make up for it and the outdoor area is super nice. I'm amazed by my 3-year-old daughter telling me about all the bones in the human body, continents, seasons, numbers, showing me her ballet and yoga skills and talking to me in Spanish. I'm very happy my little one goes to Little People Nursery. We love Little People of Fulham! The practitioners are all kind and warm and our 11 month old daughter loves spending the day with them. The nursery is well managed and has great facilities. We love getting regular updates from the practitioners that let us know what our daughter has been doing, whether she has slept and what she has had for lunch. The nursery organises well thought out programmes of activity and sends excellent communications and newsletters. We are so glad that our daughter goes to this nursery!